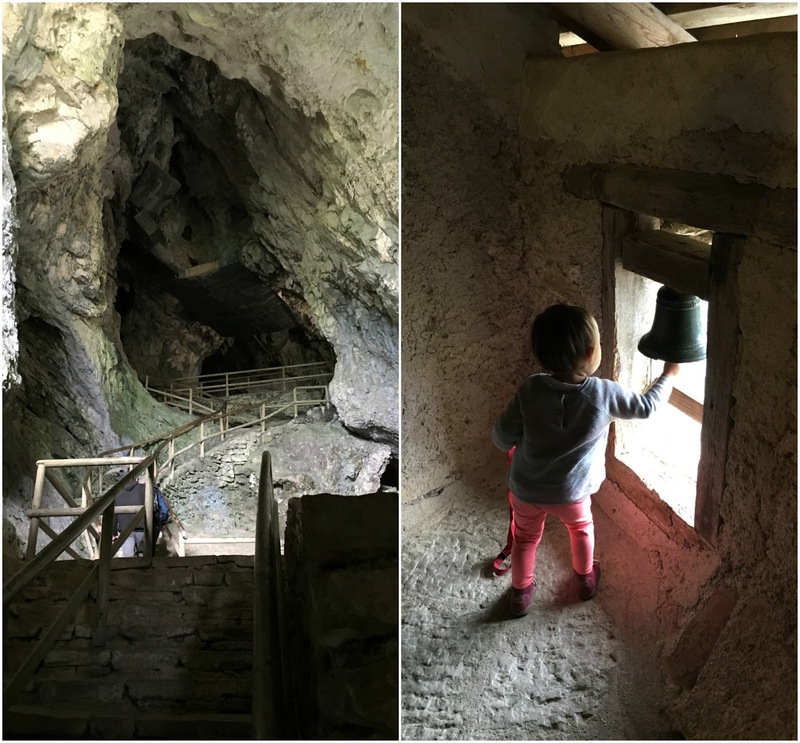 In my last post about Postojna Cave (read the post here) I mentioned that we bought a combo ticket for the cave and Predjama Castle, so after visiting the cave, we drove toward Predjama Castle on the same day. Predjama Castle is only 9 kilometers away from Postojna Cave. In July and August they have free shuttles that drive visitors between the two objects, but we were there in September, so there were no more shuttles. Babygirl is crazy about castles in general. Our bedroom in Ljubljana is an elevated loft which is reachable by climbing sturdy wooden ladder-like book shelves. We call it our castle where we sleep at, and she's crazy about it. So although it was past her nap time after we finished Postojna Cave, she was excited enough to see the Predjama Castle. Audio guide is included in the entrance fee and they're available in many languages. Each room and exhibited object in the castle show a certain number, which you press in the audio guide (looks like an old cell phone) and you listen to the narration from it. This was babygirl's favorite part of the tour, clearly. She pressed the buttons all the time, put the device near to her ear and pretended to listen and understand what it tells her. Predjama Castle, or "the castle in front of the cave" is known for the story of Erazem, a robber baron who came into conflict with the Habsburgs and killed their commander of imperial army. The Roman emperor sent army to have Erazem killed, so he hid and lived in this castle with his family. After a year, one of his maids betrayed him after he was bribed by the Romans, informing them when Erazem was in the toilet which is located on the top floor on the outer part of the castle; so they fired cannonball and killed Erazem. The exhibited rooms are equipped with life-size dolls resembling the medieval life which was super interesting for babygirl. We climbed to the top floor and got into the original part of the cave. Although it's called the "castle in front of the cave", part of it is actually inside a cave. Parts of the castle don't have a roof at all because it's underneath the cave and practically do not need roof. Despite the steep stone steps, we made it with the babygirl to the top of the castle, including to the original cave part to where Erazem and his family went hiding when attacks were going on. There's a bell on the top which used to function as an alarm system when the castle is in danger, but now believed as a lucky bell that makes your wish come true if you make one before ringing it. The whole experience probably took us an hour and a half or so, before we went back out and returned the audio guides. After a long exciting day of Postojna Cave and Predjama Castle, it took babygirl three seconds to fall asleep in her seat in the car. We drove back to Ljubljana (which lasted less than an hour) and now have beautiful memories of the impressive cave and castle.